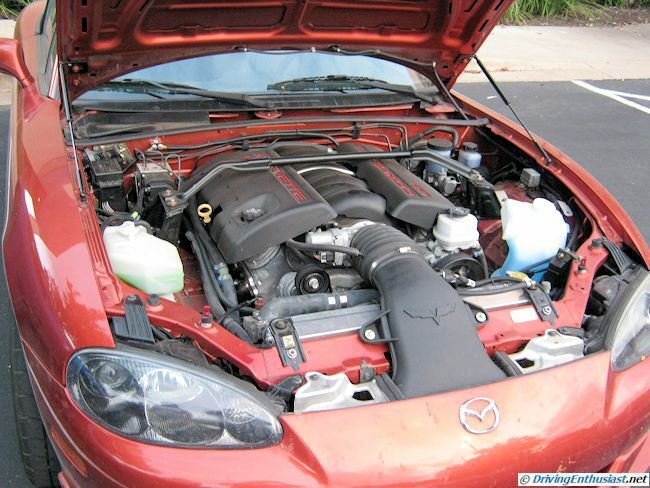 We’ve seen a lot of different V-8 engines swaps into Miatas over the past few years and covered many of them in posts here. We’ve seen neat swaps performed by individual builders, but we’ve also seen poorly executed swaps and outright hack jobs. Last night at the Cobb Tuning First Thursday car show in Austin TX, we saw the cleanest V-8 Miata that we’ve encountered to date. Built by Flyin’ Miata themselves – note the brass badge on the radiator support. As close to “factory” as it gets, and it looks it. But here’s one more feature of this particular swap that we really liked. Note the original Corvette intake tract. 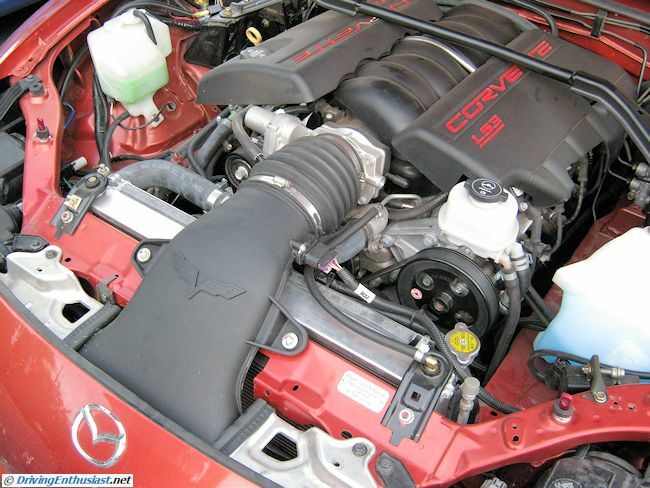 Besides being neat and efficient, it also keeps the air intake away from the hot engine compartment. Which is a major problem with all the other Miata swaps we’ve seen, where the open air filter is usually just behind a headlamp, just inches away from the exhaust manifold. And sometimes behind the shock tower, up against the engine firewall. Not smart: it’s not going to work in hot traffic, and even at speed the engine will still be ingesting extra-hot air. This approach is far better.